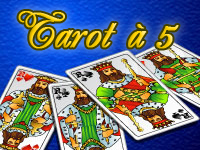 Tarot is a trick-taking game in which the partnerships vary from hand to hand. It is by four or 5 players. The deck consists of 78 cards. The four standard suits of diamonds, hearts, spades and clubs, In addition to the four standard suits there is a extra suit of twenty-one (trumps) numbered from 21 (high) to 1 (low). Finally there is a special card 'the fool', marked with a star in the corner.